Water and fish go together, but in recent years we have gained a better understanding of how fish numbers are linked to the way water flows throughout river systems. There are 46 native fish species in the Murray–Darling Basin (MDB), and each one has evolved differently to the boom and bust nature of flow common in Australian rivers. This means they are reliant on the variety of different flows experienced within a river in order to breed and thrive. Due to this dependence on flow variability, most native fish in the MDB are suffering from changes humans have made in the river system. The protection and recovery of native fish stocks provides a range of environmental, social and economic benefits. Fish play a critical role in the river system by cycling nutrients, providing food for other parts of the food web like waterbirds, and sustaining a billion dollar a year recreational fishing industry. They are also important in the social well-being of indigenous and non-indigenous MDB communities. There are an estimated 430,000 recreational fishers in the MDB, which currently contribute around $1.3 billion each year to the Australian economy. 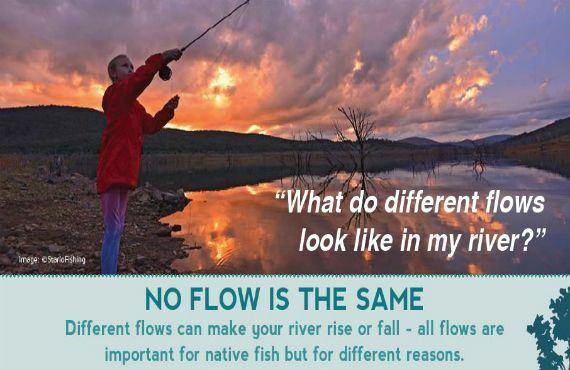 In a recent survey recreational anglers from across the MDB asked for better information on the way fish respond to changes in flow, and in turn what that could mean for fishing in their local rivers over both the short and long term. This video provides an overview of how recreational anglers and scientists are working together to ensure fish get the ‘good flows’ they need to breed, feed and move. 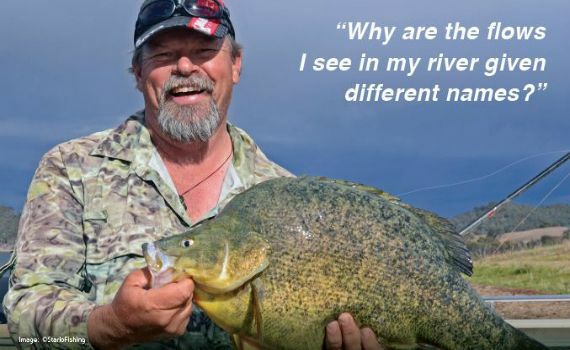 The video was largely filmed on location in Canberra as part of the Murray-Darling Basin Native Fish Forum in August 2017 and includes riverside interviews with three members of the Engaged Anglers Advisory Group (Phil Beesley, Albury NSW, Graeme May, Hillston NSW and Anne Michie, Tamworth NSW), along with fish scientist Clayton Sharpe. 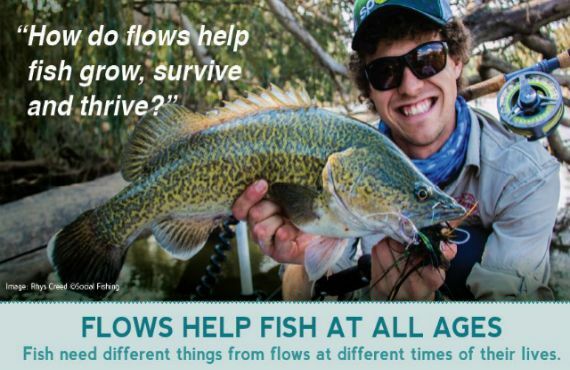 We encourage recreational fishers, natural resource managers and the broader community to print and use these infographics to help their friends and colleges better understand what our fish need in terms of flow. The infographics may be particularly useful at your local fishing stores or club event, schools, and other natural resource management events. 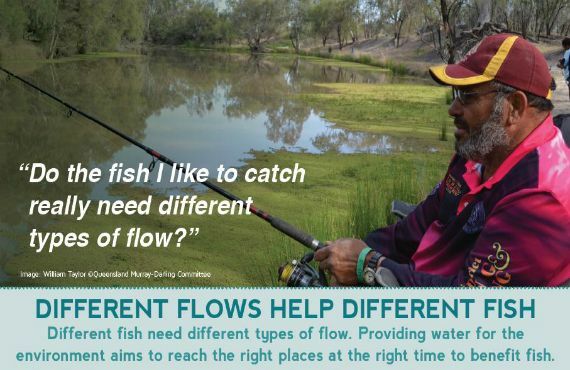 These infographics are based on best available science on fish and flows across the Murray-Darling Basin. More detailed information can be found in the following documents for the Northern Basin (PDF, 3.99 MB) and Murray River (PDF, 2135.85 KB) and the River Flows for Our Fish survey of recreational fishers by DPI Fisheries in late 2016 and early 2017. 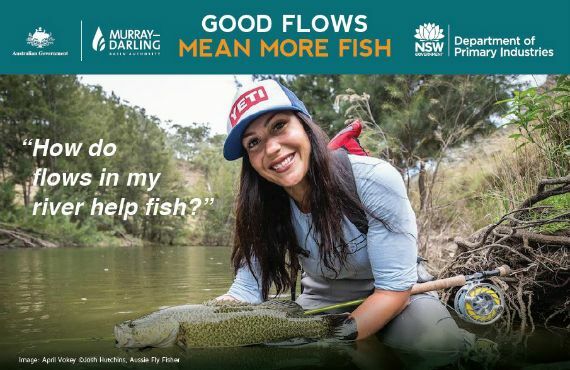 What is DPI Fisheries doing to help fish and flows in the Murray-Darling Basin? DPI Fisheries is helping to implement the Murray-Darling Basin Plan, a major Basin-wide investment, to achieve positive environmental outcomes in our rivers and waterways. Water for the Environment provides opportunities to assist fish communities in recovering from impacts associated with river regulation and human uses of water. We use the best available science and knowledge regarding native fish requirements to guide water management and rehabilitation activities. We work with a range of other government organisations and communities to get the best outcomes possible through efficient use of environmental water and by undertaking parallel complementary actions (such as improving fish habitat through re-snagging, restoring instream vegetation, riverbank management, fish passage, screening pumps and diversions and controlling invasive species). Flow management and complementary actions working in parallel will support bringing native fish back to a healthy working Basin, and will increase the potential to achieve long term social and environmental outcomes through water management. More detailed information on developing flows for fish for natural resource managers can be found in the following documents for the Northern Basin (PDF, 3.99 MB) and Murray River (PDF, 2135.85 KB). How can you get involved or find out more?